Spin chill cools a warm can in 60 seconds! Why drink a warm beverage or wait half an hour for it to chill when you can chill it with SpinChill in just minutes. Unlike chilling your beverage in the fridge or just in ice chest which relies on conduction - a very slow process. The SpinChill uses convection which allows the warm liquid in the center of the container to make its way to the outer edges of the can to be cooled instantly. This cools the beverage down at a rate of at least 20 times faster! Simply clip onto the top of a can or bottle and submerse the contain in ice and spin it cool in just minutes. Since the SpinChill rotates the drink smoothly it doesn&apos;t cause foaming or fizzing. Fits onto beer or soda cans or bottles - even wine bottles. Small and compact so it is always handy. Water resistant. 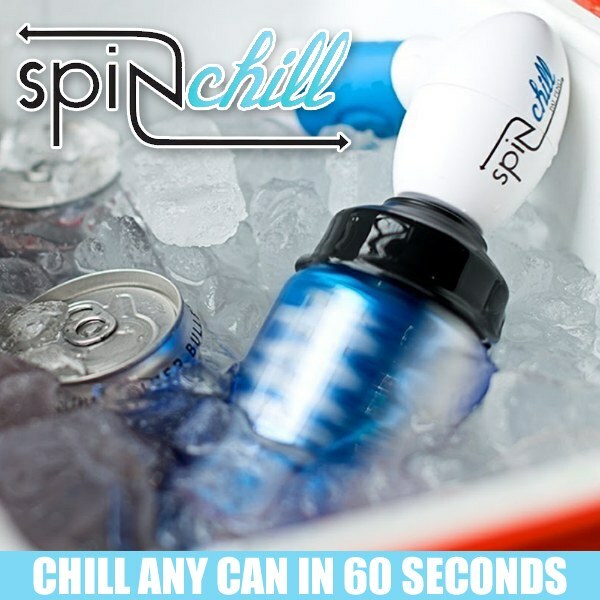 SpinChill is simply fastest way to chill a beer, soda even wine. Requires 4 AA Batteries not included. 2.6"x4.6"x7.5".